Everyone’s bought or received a gift card at some point in their lives. Gift cards are very popular with merchants and consumers alike. They’re an excellent last minute gift for friends or family and used commonly for corporate rewards and incentives. The stats say they’re good for business, too. According to CEB, 65% of consumers spend 38% more than the face value of their gift cards. Here’s the technical backstory that hardly anyone knows. Gift cards in their current form are very insecure. Let’s take a closer look. 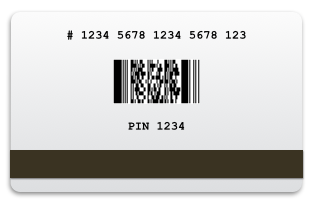 A 16–19 digit card number printed on the front or back of the card and encoded on the magnetic stripe. It’s usually enough info to redeem the value on the card. A 4–8 digit PIN, sometimes hidden behind a scratch-off label or gift card package. It’s typically required to check the balance and sometimes to redeem. Digital gift cards are essentially these codes without the plastic. Where do the codes come from? The codes are typically generated by the issuing merchant’s gift card processor and transmitted in electronic form through secure channels to distributors who may print them on cards for sale at retailers, or further transmitted in digital form to aggregators and resellers (Gyft is one), until they end up in the hands of a buyer and ultimately the gift card recipient. From the moment these two codes are issued to the moment they are redeemed, these numbers never change. If a gift card 1.0 is viewed as a lockbox with a secret key to open it, this is equivalent to sharing the secret key to transfer ownership of the card, trusting no-one leaks a copy to a thief. Each party in this chain of exchanges must be trusted to keep the codes safe from thieves. Unfortunately, gift card codes do get compromised, which results in a bad customer experience and financial loss for the issuing retailer. Retailers themselves estimate that 62 percent of gift card losses are attributable to dishonest employees and 13 percent to counterfeit or skimmed cards. Once a code is compromised, it might not be detected until redemption, and upon redemption. But upon detecting that a code was compromised at redemption, it is impossible to look back provably identify the party who broke the chain of trust. Gift cards are unlike credit and debit cards. Credit and debit cards require a standard infrastructure between thousands of financials institutions and millions of merchants. This ubiquity has led to the emergence of a few large global networks and associated protocols and APIs. A gift card, on the other hand, is a singular instrument typically redeemed only with the merchant who issued it. This has allowed a much wider variety of gift card APIs to coexist. In addition, wallets such as Google Wallet or Apple Wallet each have distinct APIs to load gift cards. Ultimately, this fragmentation of APIs results in a poor user experience. For instance, a few issuers may support balance check or transaction history while many don’t, meaning a consumer buying or receiving a gift card may have to go to a store and try to redeem a potentially empty card to know whether it has funds or not. What’s to be done about all this insecurity and lack of standard protocols? Understanding Bitcoin is key to understanding the value of moving financial assets such as gift cards onto the Bitcoin block chain. I’ll start with addresses, then explain transactions, then the block chain. A fairly accurate metaphor for a single Bitcoin address is a transparent public lockbox. It’s public and transparent, meaning anyone can see how many bitcoins are received or sent from it, and anyone with the public address may send bitcoins to it. While it is possible to have a single Bitcoin address to send or receive money from, it is not desirable. Remember, the lockbox is transparent so anyone can just watch money coming in and money coming out. If for any reason your address is linked to your identity, someone would know everything about your related transactions, which may disclose such private information as your income and expenses. In other words, addresses are how you leak or control your privacy on Bitcoin. The good news is that — unlike bank accounts and traditional lockboxes — one can generate as many Bitcoin addresses (and matching secret keys) as one wants, for free, on their own computer with just software. To protect one’s privacy, the best practice is then to generate and use new addresses for each transaction. For instance, when sending bitcoins from one of your addresses to a merchant’s address, the unsent — also called unspent portion — of the bitcoins would be sent to a brand new address called a change address. Conversely, when receiving bitcoins, the receiver can protect its privacy by providing the sender with a brand new receiving address for each new transaction. So with Bitcoin, one quickly ends up with thousands of addresses, each potentially with some bitcoins. Which is why we need wallets. Wallets are best viewed as a software or service that provides secure access to the public addresses and corresponding private keys you own. Wallets hide the complexity of dealing with many addresses. Instead, they show the sum of all the unspent addresses that it has the private keys of. 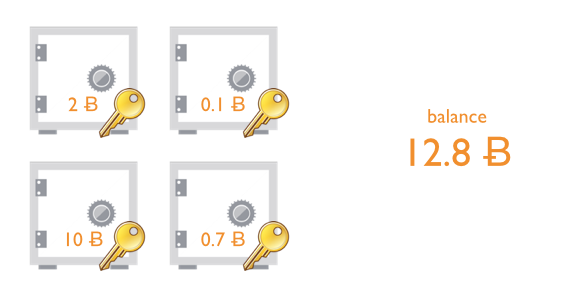 For instance, the wallet below is comprised of 4 public addresses and corresponding private keys, each with an unspent amount of Bitcoin, which adds up to 12.8Ƀ. Another function of wallets is to build transactions from addresses with unspent bitcoins. 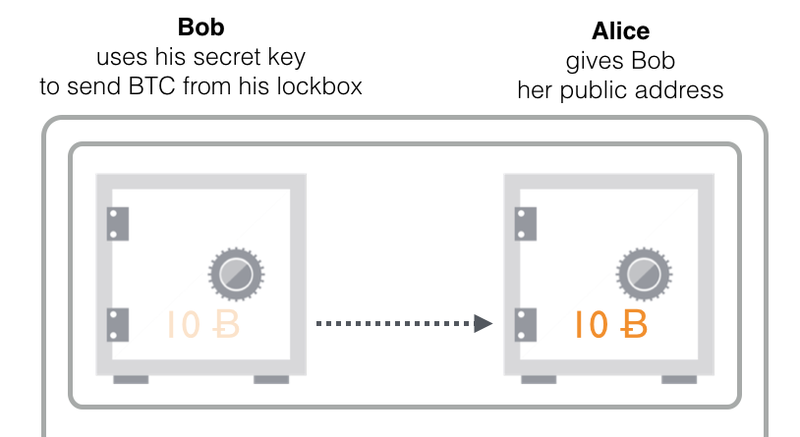 To stick to the public lockbox metaphor, a Bitcoin transaction starts with requesting the recipients’ lockbox address, unlocking the lockbox and transferring the bitcoins to the recipient’s lockbox, like slipping an envelope into a locked mailbox. The beauty of this push model is that the private key required to unlock the bitcoins at the recipient’s address does not have to be disclosed to the sender. Bitcoin is fundamentally different and more secure than card payments. Cards are pull payments: you give your money lockbox key to the merchant. Bitcoin is push payments: you’re slipping money into the merchant’s own lockbox. In practice, a transaction is built and signed by the recipient, and posted to the Bitcoin network to be verified and included in the chain of transaction blocks. How do Gift Cards 2.0 on the block chain work? Here at Gyft, we’re building gift cards 2.0 with the intention of creating a secure, instant and trustworthy gift card issuance, trading and redemption platform. Gyft Block leverages several open protocols to issue gift card assets on the Bitcoin block chain. To enable atomic exchange of assets or chained exchange transactions. BIP 70 with new BIP 70 Open Assets extensions for payment method discovery and open asset redemption at the point-of-sale. Since Bitcoin 0.9.0, there is an official way to attach an arbitrary string of 40 bytes of data to a Bitcoin transaction using a mechanism called OP_RETURN. While it doesn’t seem much, 40 bytes are plenty to add an entirely separate layer of meaning and value to existing Bitcoin transactions’ inputs & outputs. If a particular transaction output is marked as an issuance transaction for a particular asset, a unique ID of this asset can be derived from the output, and it becomes possible to track subsequent transfers of this asset from address to address. For anyone who knows what to look for in the Bitcoin block chain, it is then possible to reconstruct the ledger of transfers of such asset between addresses, and compute up-to-date balances of each address for this asset. For instance, we can record issuance and transfers of gift cards of a particular issuer. To fit as much information as possible in 40-bytes, the Open Assets Protocol specifies efficient information encoding techniques for asset amounts transferred. Below is an example of an OP_RETURN data string encoding a transfer of 5000 units of a gift card asset. How do we know that this is a gift card asset and that 5000 really means $50.00? The answer is in the asset definition file attached to the first issuance transaction of the particular asset (or just kept off-chain in a private database for privacy). The Open Assets Protocol defines a basic set of parameters for assets. A number of additional fields have been added to cater to the unique requirements of store-issued prepaid cards, a.k.a. gift cards. Gift cards fall under prepaid regulations, which vary from jurisdiction to juridisdiction and terms vary from merchant to merchant, so it is important to provide a rich framework to programmatically enforce these terms & regulations. In the U.S., gift cards are regulated by the federal CARD Act, state regulations and by FinCEN’s Prepaid Access. The federal and state rules mainly focus on fees, while Prepaid Access mandates reporting and customer information collection for certain kinds of prepaid programs. In this document, we’ll focus on Prepaid Access. Prepaid Access for instance exempts programs that provide “closed loop prepaid access to funds not to exceed $2,000 maximum value that can be associated with a prepaid access device or vehicle on any day.” A closed loop program is further defined as “prepaid access to funds or the value of funds that can be used only for goods or services in transactions involving a defined merchant or location (or set of locations), such as a specific retailer or retail chain, a college campus, or a subway system.” Unfortunately, transferability of prepaid access within users of the programs challenges the exemption. daily spending limits of $2,000, or conservatively $1,000 daily, are enforced. transfer among users after initial purchase is made impossible (FinCEN does exempt transfer through secondary markets/exchange so this is a grey area). A pratical way to achieve this is to issue cards as multi-signature open asset wallets where the co-signer is the asset issuer or a third party trusted by both the issuer and the cardholder, called the program manager. In the Bitcoin community, this model is sometimes called third-party oracle. The co-signing program manager is trusted to enforce the terms & regulations of the assets, including daily spending limits and unauthorized transfers, by rejecting any non-compliant transactions. Effectively, only transactions authorized by both the user and the program manager can be executed. Such a model can be easily integrated in a variety of wallet providers. together with an always available Bitcoin-aware service layer. Chain.com provides such capabilities and accordingly is a solid foundation to build a co-signing service for gift card assets, or any other financial asset with similar requirements. It’s not free to issue and transfer assets on the Bitcoin block chain. There are tiny Bitcoin costs. In each transaction output, we’ll transfer a minimum or dust amount of Bitcoin equal to 0.00000546Ƀ, about 0.001365$ at $250/Ƀ. Each transaction, including the original prepaid asset issuance transaction, and subsequent transfer transaction will involve one or two outputs, the second being the change address. First redemption transaction 1 with $20 redeemed and $5 remaining: 0.00001Ƀ estimated fee+ 0.00000546Ƀ for the change output TX1–2 carrying the remaining $5 value. Dust in Tx0–1 output is reused and becomes TX1–1. Second and last redemption transaction 2: 0.00001Ƀ estimated fee. Dust in TX1–1 is reused and becomes Tx2–1. Total: 0.00004096Ƀ transaction fees, which is ~0.96 cent per card for its full lifecycle at current Bitcoin price. In addition to Bitcoin costs, there are wallet & program manager costs. Still, for a level of security fundamentally superior to cards (including bank-issued open loop gift cards), this is cheaper than the 2.5%+$.20 bank card transaction fee, or $1.5 per plastic gift card. Reduced gift card issuance costs with a level of security superior to bank cards will have profound effects on the payment industry. It is difficult to envision all the merchant and consumers benefits it may enable. Beyond gift cards, merchants now have the tools to print their own digital currency, which will likely openly trade on secondary markets. They will use it to reward their best customers and attract new ones, to bolster their cash or practice better yield management. Merchants can also publish offers that target customers with particular assets as assets may become a way for consumers to design personas. For consumers, it means more flexibility, usability and value. Prepaid cards can be bought or reloadable in any amount, instead of fixed denominations. Balance can be reliabily checked from any merchant in the world. They can be easily added up in one balance and one transaction history, easily bought & sold instantly from issuing merchants or on secondary marketplaces with/for any other asset. Virtually any asset can be converted on-the-fly to any asset acceptable by a merchant. Ultimately, intelligent wallets will be able to connect to marketplaces, identify arbitrage opportunites and perform in the background complex chains of trade that maximizes the consumer’s purchasing power without compromising their privacy or control. Interview between Heather Schlegel (@heathervescent) and Guillaume Lebleu (@giyom), co-founder of Credibles. Recorded on July 18 2014, funded via the Future of Money Kickstarter. HS: So let’s think about the future. Let’s go 10 years in the future or maybe 5 years. I’m curious how you think it would be interesting or you’d like to see crypto equity or some of the ideas you’re exploring with Credibles. How could those become more an everyday experience. What world do you see or would you like to see in 5-10 years? GL: One of my favorite own quotes [laughters] is: in the future we’ll pay with our own promises, and we’ll vote by accepting others. And I’m not saying this is what we’ll do all the time. But I think there is truth to the fact that money and politics are very much intertwined. GL: One of the reasons for money, the idea of guarantee liquidity in a given country, is to tax. People try to think, we’re going to create apolitical money, and Bitcoin is this, and I think the two [money & politics] are very much related. I think money will evolve alongside with new ways of governing ourselves. I’m just going to give you an example that I think is possible. Today for instance, governments fund themselves by going in debt, they borrow money, and pay back interest. I think in a 5-10 year timeframe we could see governments, cities, simply issuing credits into circulation. Maybe as a way to pay some people or just to deal with some of the fiscal difficulties. And today this is viewed very negatively by markets, and I could see in a 5-10 year timeframe it may not be seen so negatively. At the government level at the macro level, there’s also the discussion about technology disrupting jobs and the necessity of having a universal basic income, which also goes against this idea that governments have to borrow money. So, I see a future where a lot of different entities will issue some type of promises redeemable for something. So for a government, they’ll probably still do tax, but they may be issuing these credits to fund some projects or give purchasing power to their citizens, and they may tax it back in return. At the company level we could see that as well. GL: The whole system of having debt and equity, it may be such because it was too complicated to use these assets [equity] as money, as a medium of exchange, but if everything is very easily transferrable and easily priced, I can go to a merchant and [transact with it] …. you know I was in Europe when they did the change from national currencies to the euro, and at the time, it was a big challenge to have two currencies. Every store for two years I think had two prices on each item. Very expensive. Now for bitcoin, we don’t have a bitcoin price tag for each dollar price tag, it’s on our app. Our mobile phones become the price tag, or they can give us a view of the price of a particular product given what we have in our wallet. So I think it’s much easier to imagine a cryptocurrency/equity being more and more widely used by companies, and debt being less used basically. I don’t think this is a 5 or 10 year thing, but it’s probably in my lifetime. HS: So I totally agree with you 100% about money and politics being intertwined. I have started doing some separate research on the future of politics and how things are changing in the political landscape. I realized has to do with our relationship with our government and government entities are not the top of the most powerful in the world. One of the things I’m look at is: What’s the future of nation states, or what’s the future of a state-backed currency, like the US dollar, the euro or the reminbi, that is attached to a country. Then there is something like Bitcoin is decentralized. I can see there is value in both. I agree with you that one of the reasons, the large trend I noticed with money, and I talk about the US dollar and how it has all these values collapsed in one, so it makes transactions very efficient, you either have the money or not, if you don’t you can’t buy it. But we don’t leave in that world anymore. Just because you don’t have money, there are lots of other ways to get what you want. You can barter or swap. Maybe you want to buy from this person instead of that person, maybe b/c that person shares more of your values. These are all nuances that people are thinking about that are becoming more transparent because we have the knowledge at our fingertips. Also from the perspective of how our brains work. Having been on the Internet for 20 years, my brain expects a lot of information about things. It’s almost that as a human species we’re used to process more information than 50 years ago. I think we have extra bandwidth to want to know this information and the technology allows us to be more transparent and understand more about it. So rather than everything being super simple and collapsed, and it’s all about the money. We do care about: Where is it coming from? are they using organic locally sourced products? vs factory farming or doing something that is degrading the environment. I think these are all things we think about. GL I think we have the tools, more importantly. I think there would be some benefits for instance to have supply chains put their accounting data and inventory data on blockchains. That would provide some information, today is impossible to capture that and efficiently collect and process it. But I think there are big benefits for companies to do that. Most businesses today still send each other invoices and checks. In the food supply chain they do that a lot. Even when they do electronic, they still use these constructs. I think moving to transparent public ledgers will bring a lot of efficiently in supply chains. And then ultimately will allow people with access to the data to make more informed, or identity-based decisions. GL: I think of a wallet as a way to help you decide. Today it’s mostly: can I afford it? how much can I spend? should I save instead? can I get a loan? it’s very banking oriented. I think the wallet is also: well I have 500 different kinds of assets in my wallet, some of them I don’t even know I collected, through my activities, and when I go to the store, the price I see for a product is just for me. It may involve a lot of different things and I may not be interested to look at the details, but I may be interested to say: I don’t want to accept this type of currency here and I want to actually hold more of my wealth in that kind of currency. GL: You won’t be able to do that without a very transparent system. The kinds of things we do today at our level, you go to a grocery store, you buy product, the payment system does not know what you bought, they don’t have access to the UPC codes, but that’s clearly is going to happen. Companies like Google have a strong interest to that, the payment processor know what you bought, so you can automatically apply coupons, discounts, prepaid balances or other assets or any kind. So I think we’re not too far from that. HS: I also totally agree with that. Fidor bank in Germany is a banking dashboard and they allow you to basically assets. It’s not just assets you hold at that particular bank. My bank allows me to put in other accounts b/c they are probably accessing through APIs. But it’s still within the traditional banking system. But It’s not like my Amazon credits, or my Amex rewards points. I love that I can buy stuff on Amazon and pay for it with my Amex rewards points, it’s really interested how I choose which things I’m going to to use my rewards points for and which ones I’m going to pay money for. Sometimes I talk about AI, it’s really about a smart system that understands your values and your beliefs and when you’re in this store, I want to use these, or if something accepts this is my preferred currency to transact with in these situations I’d prefer to transact in these other ones. HS: If I can go sci-fi here. There is some ideas about creating separate identities that may or may not be linked to me. If you think about internet of things, where you have a car as an identity and I’m the owner of it. When I am no longer the owner of it, maybe it will go off and start have an identity of its own. GL: From the standpoint of internet of things, I would not call that identity. Certainly, all the keys, whatever requires me to start the car, or open the trunk, will become tokens on of some these chains. I think anyone would reasonably expect to be able to look up the complete history of the car from public records, meaning on the Internet, on the chain. In general, I’m really struggling with the notion of Identity. It seems with bitcoin, we solved the problem with double spend in a decentralized way. But with identity we still have to crack that problem. How do we humans prove that we are humans. Right now the only thing we have is computers who are able to tell something about us. I’m always looking for where identity intersects with currency, with these cryptocrurrencies, because I haven’t yet a solution that satisfies me from an identity standpoint. HS: Are you talking about KYC within crypto currencies? GL: I think the identity in that context is very much tied to your tax ID and government records. But people need some privacy and they will want. I don’t expect to have my identity stored with one party. It’s something that’s very dynamic that I want to change over the time. Things like having a collecting of tokens of the Web that I can claim my own I can prove my own and in some cases I can transfer. That’s an interesting way to build an identity system. Namecoin for instance is interesting. I can put a piece of data on name coin and I can prove it’s mine. I’m really fascinated by building identity on top of bitcoin. HS: I’m writing a brief right now on reputation currencies. You’re talking bout showing/hiding different currencies you hold. It’s almost a different type of reputation currencies, it’s using currencies to create reputation, and show your identity through your financial assets and show different assets. GL: Yes, it’s the fact that you have assets – a layer that’s pseudonymous – and that you wallets on top. Instead of having wallets directly holding assets, tying your identity to assets. In a way in a bank we have account numbers and we have assets in these accounts, but really there is no bank you can do a transfer just with your account number, you have to prove your identity, and by that they mean showing your government card. What’s interesting with bitcoin is that it’s bringing again this separation between assets, accounts, and building wallets and identity on top of which assets I control. That means I can decide I can prove I own one or not, and even if I can prove it I can decide not to show that I do. It may not be the identity model that governments may want but it’s a very interesting one for people. Future of Money Interview. Part I. On Credibles and owning digital currencies issued by brands you love. HS: Would you mind giving us a quick introduction about yourself, your background and what you’ve been working on? GL: My name is Guillaume, I’m French, I’ve been in San Francisco since 98. I’ve worked in fintech since 2002. I started a company called Brixlogic which was doing financial middleware for banks and insurance companies, and that company was bought by Diebold in 2007. I’ve worked for Diebold which is a leading self-service banking solution provider for several years and then I decided to quit my job and focus my career on digital currency. So my first project was a local community currency in San Francisco in the neighborhood of where my business partner and live. Bernal Bucks is a pretty successful community currency in the sense that it is still running and people are pretty addicted to it. It was very unique because it was attached to a debit card issued by a local credit union so it’s a community currency in the form of a rewards program attached to a debit card. That was pretty unique in 2011. GL: Since about a year and half ago, I’ve been focusing on Credibles which is in a way taking Bernal Bucks to the next level. I think community currencies are interesting but I wanted to do something that had a bigger potential in terms of adoption, not limited to a particular community and also not necessarily attached to a debit card or to the existing banking infrastructure. So, we took what we have learnt from Bernal Bucks and we turned it into a community currency if you want but for food, and in this case, with Credibles, it’s not attached to a debit card, it’s a self-standing program and it’s more about crowdfunding food businesses and rewarding people for doing that. So there is some element of traditional banking money, but more than that it does not have a strong regional focus. We are in several states, at this point we have about 100 businesses who use the platform. We have businesses that have raised anywhere from $10K to $100K, which they use as working capital to fund different things like an electric generator or some improvements. So what’s really unique is combining the notion of crowdfunding or community funding with a currency, and of course our focus on food, which we thought was a very useful focus because it is something that people really care about that they do everyday, so it’s a good use case for a currency. And just recently we announced a partnership with Whole Foods Northern California. They’re of course very interested in food and they actually have a local loans program so they do a lot already for their local producers to try to provide them financial aid in the range of $25-50K loans, and they are looking at Credibles basically as a way to extend that program to their customers, and allow their customers to also fund their favorite food makers. HS: So, last time I visited up in the Bay Area, we met at a Whole Foods and you walked me through going in there, buying some stuff using Credibles. Can you describe the typical example of what you walked me through? GL: Let’s take the example of a creamery that we’ve been working with. They do really good yogurt, it’s a small creamery called Saint Benoit based in Petaluma. They use special kind of cows that produce this very unique yogurt. They sell through Whole Foods and through many other retailers, they also sell direct at Farmers Markets. So they started using Credibles for customers going through Farmers Markets. The way it works is that someone who buys their products all the time is given an offer which is: pay us in advance, get 5%, 10%, 20% more. So basically you convert your US bank money into Credibles which you can redeem at that particular business. And so you have a little mobile app to track your account and reload, and gifts, all the typical activities you do with a prepaid account. And then the business also has an app, similar to a Square for Credibles, that they use at the Farmers Market to redeem your credits. So that was the initial model and of course some customers were saying: well I love their products but I go to the Farmers Markets but I also go to Whole Foods and other retailers so it’d be great if I could use my Credibles there. So that’s one of the businesses that helped us start the relationship with Whole Foods. So at Whole Foods the experience is like a self-checkout experience, you need to have the app to redeem your credits. So you go in the aisle, pick the product you want that you’ve already prepaid and then when you’re at checkout the app generates a code that you have the cashier scan and that basically takes the product out of your receipt. At that point you effectively get it for free because you already paid for it. And after that obviously your balance has been updated. So, essentially you get the benefit of buying in bulk but redeeming and buying the products over time. So obviously you wouldn’t be able to buy 10 jars of milk and keep them at home, but some people who buy these products all the time, the idea is why don’t I put my money upfront, get 10% more and at the same time, I’m helping the business, and I love their products so why not? HS: I thought it was so interesting, when we walked into the Whole Foods, that you went to the yogurt cooler counter and you pick up this neat looking product, you scan it, and you still have to checkout but you didn’t pay money to Whole Foods. The traditional grocery interaction is: you pick up something from the shelf, bring it to the cashier, they ring it up and you give the money and you get the thing. But here you went to the shelf, you said you were going to redeem something you had already prepaid for, it generates this code, and when you got out of the store at checkout you said you had already paid for this, and the store scanned it so they can track their own inventory of products. GL: Yes, it’s one step away from what the ultimate experience would be which is you pick up the product, you self-checkout on your phone and you leave the store. Like many things in mobile payments, it’s really easy to come up with amazing experiences, it’s much harder to come up with an actual business case and roll-out strategy. A lot of grocery stores would be worried about the ROI of self-checkout and the suppliers may say who’s going to pay for it, etc. so what I think is interesting in our model is that it’s a very incremental solution that has a very clear model for the vendors. they get some money upfront, and for WF they get the benefit of extending their loan program to their customers, to secure some sales from their customers. So there is a real case. The integration is very simple. This gives us the opportunity to show that people are interested in that, and later on it could be expanded. HS: Yes, it made me realize that you’re going in to pick up this product that you’ve already prepaid. You have such a good relationship with it that you’ve prepaid it. If there are other little things that you need to pick up at the store at the same time, it’s very convenient to go to Whole Foods. The checkout experience when you are checking out and you are buying things in the traditional way and the way that you do with Credibles is still very easy. They ring your stuff up, they you got the code that you show, which comes as credit on your receipt, you get to only pay for the items that you haven’t prepaid, so I think you have a really elegant solution that helps people do the same normal type of experience that they are used to, but combine these two things like having this special relationship with a local producer, but also do their normal grocery shopping. GL: Yes I think what’s really interesting is that today a good maker who sells at WF, basically what they know is how many units and how much money was made with their products, in each store. But they don’t know who bought. They don’t know what they bought. Even in an anonymous way. In the Credibles model, they get to know that, because the credits you have are credits with the food maker and what’s going on in terms of accounting if you want, is that you bought these credits from the food maker and then you go to whole foods, WF accepts these credits and then they redeem the credits back to the producer, so the relationship is really between you and the producer; Whole Foods is just the party accepting and facilitating the redemption. So I think this idea of store credits for a particular brand and having other parties accepting these credits is one trend I see. For instance, we’re not the only one to do this. Apple just launched in Japan a virtual prepaid card with iTunes credits. Someone was speculating that – if that is their mobile strategy, maybe not – most likely you’ll be able to use your iTunes credits at other businesses. GL: We can also reasonably expect the Starbucks card to be accepted at other neighboring businesses, who may see value in accepting the card. That’s the premise: in the future, people will hold a part of their assets directly with some of the brands that they trust and they love and may not have all of their money in their bank account, some of their money in digital currencies, but also some of their money with brands they love. That’s a trend that we see. HS: That’s really fascinating. I want to ask you a question about that. I have first a question about interoperability. The transferability of the credits. In the case of the creamery, say I prepaid $250 of yogurts. Is there a way that I can change it with another one with someone else on the network to get eggs or vegetable. GL: That’s where this currency aspect comes into play. To me currency is not a thing, it’s a network. It’s people, entities, accepting accepting, exchanging, clearing things with each other. There are several ways to create liquidity in such a network. One way is you accept other people’s promises. The other way is people trade or swap with each other these promises. In away banks are ways to do that today. They are pools of liquidity that provide us – by commingling assets and liabilities together – some access to liquidity. And if they don’t have enough liquidity, they can always reach out to other banks to provide us liquidity i.e. access to various other places in the banking network. So, with Credibles we just started to provide this capability to pool credits with each other, to allow people to share with each other some credits. What that means is that you can join a group of people and businesses, and put some of the credits that maybe you don’t want to use anymore, and pull out some other credits from another business. And we do this on a sharing basis. What it means is that you put in 10 and you get 10. There is no arbitrage or trading or buy/sell order, etc. But the result is that it provides very good level of liquidity. So, Bernal Bucks was actually modeled around the same principle, which is that you have promises/IOUs from different businesses and then you put these IOUs into a pool, which we call Bernal Bucks, and that gives you a balance with the pool, and then when you want to redeem your credits, Bernal Bucks or Credibles, you pull out something that you want, typically from another business. So it is essentially user-generated liquidity. Just like we have user-generated content with social media, we can have user-generated liquidity with these new forms of financial media. HS: I think it is so fascinating. Back to my question I was curious about. So, you’re talking about crowdfunding of local producers, and how we may hold some of our assets directly with some of these businesses. Today we do this with stocks and typically invest in the stock market for a financial return so it’s all about the money and the profit, not about the context or the way that the business does business. In this case, if I’m micro-loaning to the creamery, I’m doing that b/c I believe in the same values, I want the product, I want a local producer, I’m getting a deal, a discount. I’m just wondering: how do you see what that is – even with the starbucks card, you’re essentially giving a loan. How do you see it fitting with stocks? GL: I think there’s going to be a number of things. You’re not going to invest your retirement on future eggs, or reputation currencies. Money at the core is a store of energy, it’s a way to get others to do stuff for you. You need that when you’re old. What I think is weird right now in the financial markets is not knowing what’s going on with you savings. HS: Like say you have $20K in the bank, the bank is loaning to others, but you have no visibility into that, you have no rights to say: Oh I don’t want this money invested in this, this or this. GL: Right, yeah. [technically they are not loaning your money out, but in principle you’re helping them making other loans] similarly when you buy stocks, that’s directly capital and energy towards that company. And if you are only seeking returns in money, and if you don’t care how the company is generating that profit, I think there is something missing there that leaves a lot of people wondering sometimes. What’s in my IRA? What’s in my mutual fund? which company I’m supporting? which causes I’m indirectly supporting? so I think there is a general demand for at least a new class of asset that will give you more transparency into how your saved money is used and holding some credits that can be redeemed for goods/services, that’s one of them. But you could have different things. There is no reason in principle that you could not redeem a stock in goods/services as well. You could have forms of equity that pay dividends in money but only pay dividends in goods/services, but still carry a speculative [equity] aspect. So, recently there’s been some more talks about crypto equity. A crypto currency is like a stock, a piece of equity over a community of people. That’s how I see Bitcoin. It’s equity mostly. So, if you’re a company, technically you could raise a lot of money a lot of energy to do what you need to do, and use that instrument as also a way to redeem for goods/services. So right now, we’ve [Credibles] chosen a very simple instrument that people are very familiar with – because prepaid is very simple, it’s very well understood, regulated, etc. Crypto-equity or equity redeemable for goods/services, that is much more complicated. I think as we move a lot of these assets on public block chains, I think we’re going to see tremendous innovation on how you buy these products, and how they are structured and what payouts they give, and they may not only be payouts in money, they may be payouts in other things. I could see for instance a loan whose principal is paid back in money, but whose interest is paid in goods & services, or the reverse. HS: That’s a really interesting idea. I was thinking about that, where the loan is paid back in money and the interest is paid back in goods & services because basically what you’re allowing is that the person making the loan is also getting some of the results of what has been capitalized, whether it is the product that’s been built. – you need enough money to do certain things with it but once you get it going and you’re growing, do you want to continue to make more money or, I mean you’re probably went into the business to make the thing that you’re making rather than to make the money to use for other things. I know that a lot of artisanal producers are doing the work because they love doing the work, not because they want to become a millionaire. GL: My view is that we could imagine a world where there is a lot of these crypto equity and that becomes one of the main ways that we invest and pay each other and buy stuff. I also think that the kinds of innovation that we see: derivatives, pools, are also going to be used. Of course when people think about these derivatives, they thing Oh my god, this is what led to the financial crisis, but really what I think led us to the financial crisis is the lack of transparency on these instruments. I’m not an investment banker but I think a lot of the collateralized debt obligations and things like that where basically a pile of papers or spreadsheet and proprietary software, plus lots of contracts, so of course when some unanticipated event happened it was hard to reprice. GL: Now that we are moving to public ledgers with a lot of transparency, I don’t think it matters as much how complex some of the smart contracts built on top could be. So the pool that I was describing earlier, that we’re using, is a smart contract: it’s basically a bunch of people saying we agree to put our credits together and then when we need what we want, we can take out of the pool whatever is in the pool. And this is a smart contract, it’s an agreement between people. It’s not a problem to do that as long as there’s a lot of transparency and as long as all the cases where things could go wrong are taken care of and well programmed if you want. So I think there is going to be tremendous innovation on top of the block chain we see today using smart contracts. I think what people should be really excited about is the blockchain. BitCoin just an app. Exciting: having the ownership of every single real/virtual object in the world recorded on the blockchain. [Transferrable to anyone in real-time.] Cars, houses, hotel rooms, airbnb stays, IOUs, store credit, stocks, art, etc. all recorded on the blockchain. In the future your car may connect to the blockchain to check that you own it and can start it, for instance. This is a piece I originally posted 2 years ago as a comment on emergentbydesign.com. The money we use is Government money or levered Government money (bank credit). Government money is backed by legitimate force. The question is: what do this money become when force becomes not only illegitimate, but ineffective? I think that we may have or be closed to have reached the limit in using legitimate force (Government) to back our money. There are several reasons for this evolution: dwindling returns on the use of force in driving the success of large organizations, gridlocked political processes, environmental limits, difficulty to monetize the growing immaterial economy, and many more. If so, the current monetary system used is likely to continue to deflate, as debts are paid or defaulted on, with regular bursts of inflation by fiscal/monetary authorities but with decreasing marginal returns. The good news is: we are bound to continue to grow, to pursue Happiness, and we will need systems to continue our growth. But more likely around “soft power” systems, where reputation plays an increasing role. In other words, the future of money is less money and more not so random acts of kindness. In other words, we can deflate in monetary terms, but inflate in terms of social currency. There is a lot for bankers to do here. Banks are not going to go away. As trusted intermediaries, they will likely play an increasing role in providing us with convenient, actionable and reliable access to data about other people and organizations, not just the money we owe or are owed. This evolution will take time. Money is here to stay, but over time, it may decrease in relative importance to social currency. It’s time for banks – big and small – to leverage their assets and position themselves in this space. Most of the money we use is already bank-issued checking money in the unit of account of fiat money. Deposits are IOUs of the bank, regulated by the Govt. The demand for most of the checking money we use is not driven by fiat but by the fact that some people want to get in debt and then have to find the money to pay it back. So banks have already put their weight here. What I am saying above is that there is a shift in people’s willingness to borrow on the basis of secured IOUs, that is secured by the use of legitimate force to liquidate their assets should they not be able/willing to pay back. Most checking money in the US are backed by mortgages (60% I think), which means that ultimately most dollars are backed by the right of a Sheriff to come to your house, throw your stuff on the street, change the locks and tell you “sorry just doing my job”, then auction off your house. Having such potential violence backing our everyday’s transactions is not a necessity, and one could argue that it may be counter productive. Now, people may not be willing to borrow and pay with checking money backed by legitimate violence, but they may still be willing to pay with unsecured IOUs backed by their own productive/creative capacity. So if I’m a programmer, I’m willing to pay with $ backed by my programming skills. Of course, these will not have the same liquidity as $ backed by secured IOUs, but may go a long way in some cases (see ). In this model, Banks could play the role of IOU routers in the network of participants, not issuing IOUs of their own and discounting people’s, but merely helping the IOUs flow. At the extreme, why even give unsecured IOUs, why not just publish for everyone to see that you receive goods/services of a certain $ value on the Web, without any explicit contract to reciprocate, only a social pressure to. Over time, those who reciprocate would certainly receive more goods/services than those who don’t. In this model, banks could play the role of trusted repository of reputation data about participants, making sure your reputation is correctly accounted for and not tarnished/spammed. In conclusion credit money is just reputation turned into commodity through the use of legitimate force. There is a limit to it though and just as we have experienced a resurgence in commodities as store of value, we may see a resurgence of peer credit as medium of exchange. IMO, none of this will replace fiat money or bank money, but we will expand the spectrum of possibilities beyond what is currently available. As we mediate on the devastation of hurricane Sandy, one thing to consider is the usefulness and the resiliency, if any, of the new money technologies, during such a disaster. Here’s a collection of tweets related to payments and #sandy that gives a taste of where we are. Something we are striving more and more to do is to be considerate and conscious of supporting our neighbors. Sometimes, I could go find something cheaper, but then it wouldn’t support the merchants on the hill who are making Bernal what Bernal is. Each of these merchants are daily stops. Maybe economically it does not make much sense, but it feels more involved to see people everyday and say hi, have that process. Why is it that something that feels like it makes sense may be said to not make much economic sense? What if it is not making economic sense only because we have impaired economic sight, because we are only measuring the transaction in one unit – financial capital, but are missing measurement of the same transactions in other forms of capital. I recently met Alexandro Lazlo, a system scientist, who shared with me his typology of capital. According to him, there are 10 dimensions of capital, financial capital being one of them. I thought it would be interesting to think about the kind of measures that we could come up with for any given product or service purchase. While our Bernal Bucks rewards card focuses only on two dimensions: financial and social (building relationships with businesses), it’s interesting to thing about the consequences of having a mobile point-of-sale device in your hand able to not just scan barcodes to retrieve its price and keep track in a shopping cart, but also to retrieve information related to all of these capital dimensions and helping you make a very different economic calculation. We may soon realize that the things that didn’t make sense economically only didn’t because we were making economic calculus with very limited information. Here are Lazlo’s 10 dimensions of capital. Natural capital: how much energy was consumed to produce this product, what type of energy, how renewable, what raw materials were used, in what quantity, how much was wasted or actually ended up in the product? Manufacturer capital: how many products/services like the one I purchased were manufactured or serviced? where are they located? Financial capital: not just how much it cost to purchase, but how much it cost to produce. Also, how much will it cost in the future to maintain or recycle. Technological capital: which technologies is the product or service advancing or making available to a wide number of people at a lower cost? Intellectual capital: what patents were involved, which were created as part of the process, how many? Human capital: who are the people who manufactured the product, how did the production of this product contributed to their long-term well-being. Which communities of people does owning the product or using the service grants access to? Social capital: which connections the purchase of the product or service created. The retailer, the designer, the workers, the suppliers, etc. Are these people accessible to converse with as a result of the purchase of the product/service. Cultural capital. Which values and culture does this product or service supports. Which communities is it linked to. Ecosystemic capital. How does the purchase and use of the product or service contribute to the biotic robustness of the region I live in, or the regions I care about. How does the product/service contributes to my long-term heath and those of the people I interact with. Evolutionary capital: How friendly is the product open to mods, user-generated improvements, what user/hacker communities exist, how available are development kits and resources to innovate on the product or service as a platform. What drives demand for money? John Carney at CNBC tells the fascinating story of a college currency called the Buckaroo and asks the question: is the demand driven by the community service taxes that the college only collects in Buckaroo, or is it driven by what goods/services these Buckaroo can be traded for from students. John argues in favor of the latter. This has implications for real world economics, of course. It demonstrates that taxes are not sufficient to give money value—at least, not beyond the level of near-term anticipated taxes. What is required first is the creation of wealth, or genuine economic output. The desire for the products of our economic output drives money. If productivity collapses—or if it is anticipated that productivity will collapse—the value of money will collapse right along with it. There is no need for coercive tax to assign value to the unit in a credit system. All is needed is that the units be accepted/ recognized by those with the products/services people want, and people willing to get in debt measured in such unit b/c they know they will be able to earn/repay later. Case in point: kids spend enormous amount of time earning points in their virtual games, only because they can buy virtual goods that they value from the game’s marketplace. No taxing authority here drives the demand for the virtual currency. Another example are rewards currencies. Hoarded and desired enough that they are used by some as pseudo-money, not b/c of taxes, but b/c they are redeemable for travels. So what does the capability of forcing people to accept a computing entry in exchange for desired goods/services bring? what does the capability of taking back by force these computing entries and deleting them bring? what does the capability of arbitrarily creating these entries and buying other entries with them bring? It brings stability of the liquidity over time and space. I ran out of credits characters before I could finish my thought. What I describe is the very reason why Governments borrow money. They could spend it and tax it back, but instead they spend it, then borrow it, then tax it. Why? Well they borrow it as a way to show that they are not abusing their coercive spending power, while providing a risk-free financial savings assets and stabilizing the amount of liquidity available in space and time via monetary policy. Of course one can question how well there are doing this. It seems that – perhaps because of a political process driven by money – every market-driven credit expansion comes with demand for lessened Government oversight, while market failures require massive and messy Government interventions. In both cases a more gradual counter-cyclical use of coercion might be a good idea, but somehow it never works out this way, only through bubbles and crisis. The big question then is whether there is an alternative to coercion for keeping a credit system robust and stable. More specifically, is there a decentralized algorithm, a set of simple rules through which we can provide good enough liquidity in a way that matches the (hopefully expanding) real productivity. In other words, will banking someday shrink to a clearing algorithm, in which everyone will pay w/ their own promises and will vote by accepting others’? It is said that a city inside a group of people enjoyed the village idiot. A poor man of low intelligence,odd jobs and lived on alms. Every day they called the idiot at the bar where they met and offered him the choice between two coins: one large of RÉIS 400 and one smaller of 2,000 RÉIS. He always chose the largest and least valuable, what was the laughing stock for everyone. One day, a group member called him and asked him if he had not realized that the larger coin was worth less. One can draw several conclusions from this brief narrative. The first: Who looks stupid, is not always. The second: What were the real fools of the story? Third: Who is greedy ends up spoiling their source of income. But the most interesting conclusion is: The realization that we can be good, even when others do nothave a good opinion about us. Therefore, what matters is not what they think of us, but who we really are. The greatest pleasure is an intelligent man playing the fool on a fool who plays the intelligent man (Chinese proverb). From a PhD dissertation on social money. Money that can buy you a future. In Andrew Niccol (Gattaca) latest dystopian science-fiction movie “In Time”, money is time, quite literally: money is measured in seconds, minutes, hours, centuries and beyond 25, people need to earn and buy themselves time, every minute of their life, or die in an instant. A very privileged few have enough to buy themselves immortality. Will Salas: Quality time… There really is a man with a million years. Philipe Weis: It’s my first million. It won’t be my last. Will Salas: You know how much good it could do? Philip Weis: I know how much harm it could do. Philip Weis: Even if you give a year to a million people, you are just prolonging their agony. Sylvia Weis: We are prolonging their lives. Philip Weis: Flooding the wrong zone with a million years, it could cripple the system. Will Salas: Let’s hope so. Sylvia Weis: We are not meant to live like this, we are not meant to live forever. Although I do wonder, father, if you’ve ever lived a day in your life. Philip Weis: Is that so? You might upset the balance for a generation or two, but don’t fool yourself, in the end nothing will change. Because everyone wants to live forever. They all think they have a chance at immortality even though all the evidence is against it. They all think they will be the exception but the truth is for a few to be immortal many must die. Will Salas: No one should be immortal even if one person has to die. Without having to go in a far and dark future, the connections between money and life or death are many. If wealth is what sustains life, in our industrial society, money is pretty much the only way to access wealth and survive. Moreover, money is already a way to prolong life. It can’t prolong it forever, but it can significantly increase the probability of a longer life. Money is also a way for us to at least convince ourselves that we can conquer death by minimizing its unavoidable effects. In the past, the belief was that giving to the clergy would buy yourself a ticket to paradise “what you give in this life will be returned to you to a thousand times in paradise”. Nowadays, the belief is that the state can maintain and ever growing set of public services as well as keep financial markets stable enough that our financial life insurance products can be relied upon to provide for our loved ones in the event we die. Modern money itself is backed by the sovereign’s ability to force us to accept coins, pieces of paper and bits in exchanged for real wealth, including labor and sometimes life itself. Ultimately this force comes from the legitimate use of the threat of death. Last, money like death, is something that our society tries to hide. We no longer use envelopes to wrap dirty cash, and don’t even need to pay with a cold, business card-like plastic card, we can just say hi and act as if what we just ordered we got for free. Death is just like that, something terrible that no one should talk about anywhere, as if it’d never happened, and instead revere youth. What this intimate connection between money and life/death mean is that while there may be a bright future for all kinds of new currencies, there is still also a bright future for currencies that can truly guarantee you a future, and in some case help you overcome death. privacy: few people other than ourselves will know, and it will not be used for daily transactions. security: they will be very difficult to misappropriate. high trust: they will rely on a framework that we know will survive us well after we are gone. redeem-ability for goods and services that can keep you safe from harm, save your life or simply help prolong it. For instance: healthcare savings account + life insurance policy + access to a large network of healthcare, fitness, safety/security services.